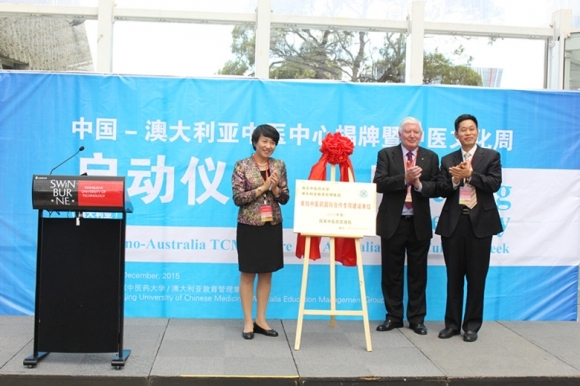 On December 1st, 2015, the opening ceremony of “Sino-Australia TCM Centre” was successfully held in Swinburne University of Technology, Australia. Delegations from State Administration of Traditional Chinese Medicine (SATCM) of the P.R.C, Melbourne City Council, Nanjing University of Chinese Medicine (NUCM), and Swinburne University of Technology, as well as the AEMG staff attended the ceremony. Mr. Roger LI, CEO of AEMG, addressed to all the guests during the ceremony. He warmly welcomed all the guests, reviewed the development of TCM culture, introduced the current situation of TCM in Australia, and explained in detail the importance of the establishment of the centre. He also extended his sincere wishes towards the future development of TCM in Australia. Deputy Mayor and Councillor of Melbourne City, Mr. Richard Foster, Associate Dean of Faculty of Business and Law, Swinburne University of Technology, Professor Joanne Austin, and Vice President of NUCM Professor WANG Changqing also addressed to all the guests joining the ceremony. They all spoke highly of the fruitful achievements so far, and were confident about the future advancement of TCM cooperation in Australia. Director General of International Cooperation Division of the SATM of China, Ms. WANG Xiaopin unveiled and then delivered the plaque of “Sino-Australia TCM Centre” to former Mayor of Melbourne City Sir Braine Shanahan A.O. Ms. WANG Xiaopin extended her sincere gratitude to all the people who have been devoted to the establishment of the centre. She also addressed that, the establishment of the centre marked a new stage of our cooperation, as well as a further communication of TCM between the two nations. After the ceremony, teachers and students from NUCM extended their sincere wishes through their traditional Chinese culture performances, and joined in taking photos with all the distinguished guests. The establishment of “Sino-Australia TCM Centre” is profoundly meaningful towards the future development and cultural communication between China and Australia. The centre is to become an advocate for bilateral communication and cooperation, and an important contributor towards people’s well-being of both nations.